The first Panda update in April has been followed up by several more updates during the last couple of months. Are these really updates with further changes to the Google ranking algorithm, or are they perhaps more of the same? We looked at what had changed after the first Panda update (https://www.sayu.co.uk/how_have_the_recent_google_panda_and_penguin_updates_affected_rankings.html) and as mentioned by many, one of the factors we found to have affected rankings is the use of the same anchor text in a large percentage of backlinks. Having checked positions of the same sites on the same keywords, we have seen the effect has become even more significant. This is mainly due to the fact that more sites have been affected. The sites already affected haven't seen a further drop in position. Of the 1081 pages that used extreme large percentage of backlinks with the same anchor text, 243 (22%) saw a drop in position by at least 10 on 30th April. By the 15th June 515 pages (48%) had seen a drop of at least 10 positions. So rather than a further change to how sites are penalised when overusing the same anchor text, it appears that just more and more sites have been discovered by Google overusing the same anchor text and have been penalised accordingly. In our previous article we looked at bed related anchor texts (which could be either the keyword itself or other bed related anchor texts), and last time we didn't find any evidence that there had been a change in the way backlinks with bed related anchor texts affected rankings. Having updated the positions, we have now found some weak evidence of a change. It appears that using bed related anchor texts has become less effective. 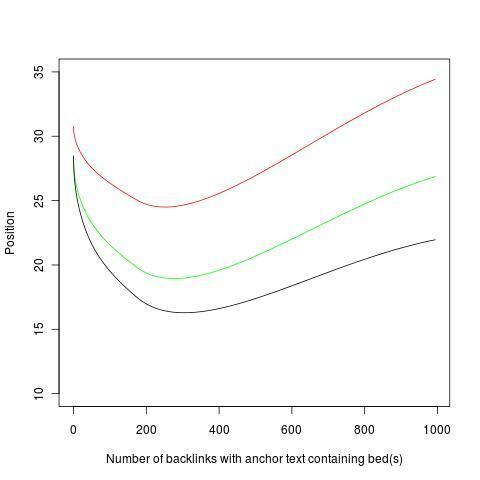 Figure 1 gives the average position versus the number of backlinks with anchor texts containing either bed or beds. (Black - 19th April, Green - 30th April, Red - 15th June). On all dates we can see that the position improves as more backlinks with bed(s) anchor text increases up to around 200-250. Using any more than that has no further positive effect on the position. The difference between mid April and mid June is that the improvement in the position is not as big any more. Using around 200 anchor texts with bed related keywords had a positive effect in April, with on average positions 10 higher compared to sites using very few bed related anchor texts. In June however, the improvement in position is only around 5 (from 30 to 25). Moreover, we can see a bigger drop in the position when a large number of bed related anchor texts is used. While in mid April sites with 1,000 bed related anchor texts were still better off than those sites that use few bed related anchor texts, in mid June you could end up worse using many bed related keywords rather than using none at all. We also looked at the effect of anchor texts equal to stemmed versions of the keywords. We found that backlinks with these type of anchor texts had become less effective. Looking at June data we found this again, and the statistical evidence is even stronger. The sites that were effected in April haven't seen any further drop in traffic, but more sites have been affected in June. 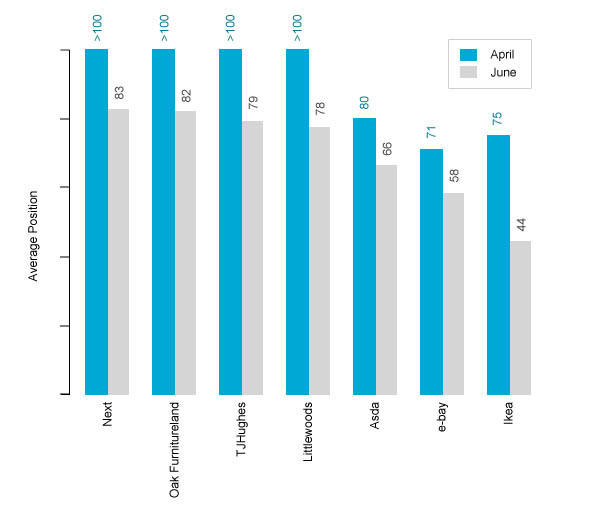 In April 22% of sites were affected, which increased to 43% in June. So rather than any further changes to google's algorithm, it appears that more sites have been affected by the change, and the Panda updates do seem to be just more of the same. Many sites have been affected by the panda updates seeing a drop in their position, either soon after the first “update” or at a later date. Among the pages we looked at, 40% have seen a drop in the position of 10 places or more when comparing 15th June with 19th April. So if there are so many losers, there must be winners as well. Looking at about 100 bed related keywords, we have seen an improvement in position for many prominent sites like Ikea, E-bay and Asda, with Ikea having seen the biggest improvement in position (see Figure 2). Some sites (Next, Oakfurnitureland, TJHughes and Littlewoods) were not in the top 100 for the keywords in April, but have moved into the top 100 in June. So while sites heavily relying on backlinks to get a good ranking have suffered, sites that have a strong brand name and probably have built up backlinks naturally, have benefited, having moved up due to other sites dropping.